The Iranian military continued to threaten Israel on Thursday, following the assassination of at least one of its senior commanders in Syria during an airstrike over the weekend, in multiple statements issued by leaders of the Iranian Revolutionary Guard Corps (IRGC). Top Iranian military leaders promised to hit Israel with "devastating thunderbolts" vowed to effect the "collapse of the Zionist regime" after Israeli military forces launched a surprise strike on Sunday that killed six Iranian agents, including the top-level commander, and five members of Hezbollah who are believed to have been planning an incursion into the Jewish state. Iran also vowed to increase military support for Palestinian and Lebanese militants in order to enable more attacks on Israel, according to statements published in the Iranian state-controlled media. Iranian leaders publicly lashed out at Israel for most of the week after the strike that killed Brig. Gen. Mohammad Ali Allahdadi of the IRGC, who was overseeing Iran’s military actions in Syria on behalf of Bashar al-Assad, the country’s embattled president. "The IRGC will remain steadfast on the path to the collapse of the Zionist regime of Israel through its continued support for the Lebanese and Palestinian combatants, but this time its supports will be on a scale larger than its supports during the 33-day and 51-day wars against the Israeli army," Maj. Gen. Mohammad Ali Jafari, an IRGC commander, was quoted as saying on Tuesday. "The Zionists must wait for the devastating thunderbolts of the anti-Israel resistance groups in the region," Jafari said, promising a "devastating response" and increased support for regional terror groups that oppose Israel. Brig. Gen. Hossein Dehqan, Iran’s minister of defense, who recently announced a controversial new arms pact with Russia, warned of an upcoming "crushing response" as payback for the strike. "The Zionists will receive a crushing response in due time and place," Dehqan was quoted as saying in Tehran on Wednesday. "Arming the West Bank is a principal policy of the Islamic Republic and we will use every means and capacity to this end," Dehqan added. He went on to compare Iran’s fight against Israel to its ongoing battle against the Islamic State, which Tehran considers "Takfiri," a term that refers to fundamentalist sects whose members declare other Muslims apostate. "Today the resistance front, as representative of all Muslims, is acting against the Zionists and the Takfiri stream and we will support it in every aspects with all our capacities," Dehqan said. Though multiple United Nations Security Council resolutions prohibit Iran from transferring weapons, the Islamic Republic has continued to move arms into Iraq and Syria to bolster forces fighting against the Islamic State. Iran claims to operate sites in Syria capable of manufacturing advanced missiles. 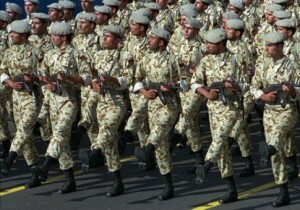 Maj. Gen. Mostafa Izadi, the deputy chief of staff for logistics of the Iranian Armed Forces, accused the Israelis of living in "fear" of an Iranian-backed strike by groups such as Hezbollah. "They thought that they will a get good result [with the airstrike], but now they know that they will receive a crushing response and because fear and fright is intermingled with their nature, they make these remarks" that they were not aware of the Iranian commander’s presence in Syria," Izadi said. "Muslim fighters will take a firm and powerful revenge for the blood of these martyrs." The head of Iran’s Expediency Council, which works closely with Supreme Leader Ali Khamenei, also warned of an impending attack on Israel. "The resistance groups are working based on a very specific strategy and they don't give up that strategy due to such incidents," Moshen Rezayee, the secretary of the council and a former IRGC commander, was quoted as saying on Wednesday. "The pivot of resistance will retaliate the Israeli attack in due time." The high-level nature of the Iranian and Hezbollah operatives targeted by Israel in last week’s attack suggests that an incursion in the Jewish state was about to take place, said Eyal Ben Reuven, a retired Israeli major general and former deputy head of the Northern Command of the Israeli Defense Forces (IDF), in a conference call earlier this week. "If the highest level of Hezbollah commanders were in the Golan Heights and the high level of Iranians, it means that their idea, [what] they’re planning could be a kind of operation, an act against Israel on a high level," said Reuven, who handled top intelligence in the region during his time in the IDF. "It says something about what they plan, what kind of operation they planned," he added. "If Israel has intelligence that says there is a kind of operation on the way to act against Israel, I think Israel would have a legitimate [reason] to do all we can to prevent it."